It’s never too early to start planning your spooktacular Halloween party, and it’s hard to say what is my favorite part. I love going over the top with decorations and pouring over Halloween invitations to find just the right one. Then there are the Halloween party food ideas. That’s where your creativity can really blossom. Really, it’s just about being gross, something that comes easily to me! I start by making a list of basic needs: beverage, main dish, salad, dessert. Then I find recipes that are easy to make for a crowd and try to come up with a creative name for them. If I run out of ideas, a quick Internet search turns up hundreds of fun Halloween party food ideas. Swamp juice (lime flavored punch with gummy worms hanging over the edge of the bowl), Greasy Guts (spaghetti salad), Cryogenic Eyeballs (frozen grapes on a stick), Gravedigger Cupcakes (frosting topped with cookie crumbs)—see, it’s easy! Just let your imagination run wild. But what fun is coming up with these cool names if I’m the only one who knows them? This year, I’m going to use some of our creepy Eye Got You personalized stickers to label my creations and let everyone see what a genius I am. I’ll order them blank and use them to call attention to my popsicle stick labels. EYE-catching! Conveniently, I can order matching Eye Got You Halloween invitations and Eye Got You Halloween address labels at Pear Tree. And, just like that, my whole party is planned. Can’t wait to see how it turns out! Keep reading our blog for more Halloween party ideas. 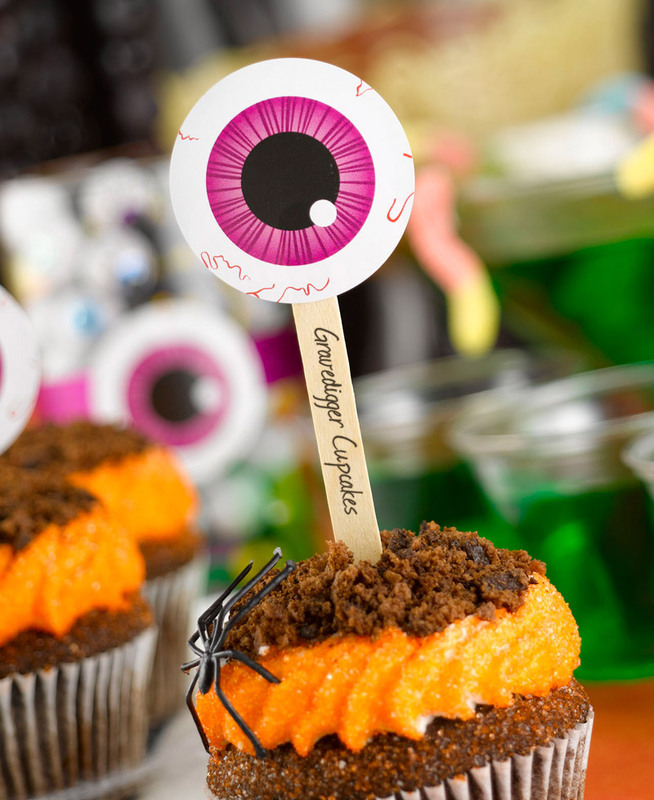 I love your creative names for food and the eyeball stickers are perfect for Halloween!